We have received numerous, thoughtful letters concerning Terry's clemency and the facts of his case. CDR Kerchner (ret) has agreed to allow us to publish his letter. Please forward this Clemency Request to the General making that decision. I attended the court martial of LTC Terrence Lakin. Needless to say I was very disappointed as to how the court martial was conducted in that no discovery or witnesses were allowed to be presented about the underlying reason that LTC Lakin believed he had no constitutional choice to faithfully live up to his solemn oath to the Constitution but to disobey orders involving his second deployment to Afghanistan to call attention to a very serious constitutional crisis facing our nation. That reason was the very constitutional lawfulness of the putative president and commander-in-chief to issue orders to surge 30,000 more troops into combat in Afghanistan. All deployments of military forces to foreign combat zones must be ordered by a lawful president and such president must sign off on such orders. Thus LTC Lakin's deployment orders ultimately did originate with the Putative President Obama, and the legality of those orders and the chain of command did not stop at the Pentagon as was stated in the records of the preliminary hearings and in this trial. The Putative President Obama has not conclusively proven to the overwhelming majority of the American people that he is constitutionally eligible to be the President. See this recent scientifically conducted national poll wherein now less than 10% of those surveyed indicated they believed that Obama has conclusively proven he was born in the USA and/or is eligible to be the President. LTC Terrence Lakin, as did I, and as did you, took a solemn oath to support and defend the Constitution against all enemies foreign and domestic. He did not take an oath to the President or to the Officers appointed above him. His solemn oath is solely to the U.S. Constitution and no one or nothing else. The Constitution is the fundamental law of the land. That solemn oath the commissioned officer takes is an officer's prime directive as to what he is to use to judge the lawfulness of all orders. And officers are charged with evaluating the lawfulness of any orders they are given. The Nuremberg defense invalidated any officers claim that he was simply following orders if his conscience suspected that the orders were unlawful and he just blindly followed them anyway. The officer's sole and solemn oath is solely to support and defend the Constitution. The enlisted man's oath is to support and defend the Constitution and obey all orders from the President, all officers appointed above you, and the UCMJ regulations. There's a big difference. The officer's oath obligates the commissioned officer to only be responsible to support and defend the Constitution, not a person or man or president. The first oath administered to commissioned officers under the new Constitution, like the current oath, required them only to support the Constitution. Various oaths were tried in between the first oath enacted into law on June 1, 1789 and the modern version prescribed in the 1860s after the Civil War. But the writers of the modern oath realized that the singular intent of the original oath was the best for the survival of the constitutional republic. Officers were and still are in general more educated, and they were envisioned to be able if need be to question the lawful constitutionality of orders and to be the last line of defense for the Constitution against from a usurper president and commander in chief, which is why in their original commissioned officer's oath and in the modern commissioned officer's oath they are charged solely to support and/or defend the Constitution. By leaving out the word "President" and "officers appointed above you" and references to the "UCMJ" out of their oath -– when push gets to shove with the U.S. Constitution and the constitutionality of orders Officers are intended to stand up and question the constitutionality of orders and stand up to defend the Constitution no matter what ... even if it means going up against a President violating that Constitution. You are charged with defending only the Constitution in that oath – because the President is not in the commissioned officer's oath and to President is not the sovereign in our republic or of our land, We the People and our Constitution are. The writer's of the oath, both the original one and modern one used since the Civil War, knew that someday a President could be subverting the Constitution to gain more personal power. In my opinion as a witness to the Court Martial, the court and prosecutors tried Lt. Col. Lakin on the enlisted man's oath. They didn't explicitly say it, but anybody watching knew it, because they were saying he has to obey the orders of the President without question without regard to the constitution of said orders. He has to obey the orders of the officers above him with out question without regard to the constitutionality of said orders. He has to obey the regulations of the UCMJ with out question without regard to the constitutionality of doing so in the circumstances the officer is confronted with. The constitutionality of the putative president now in the Oval Office was not allowed to be introduced as a defense for his actions. But follow those order blindly would have been violating the prime directive of protecting the Constitution. That oath to the Constitution was and is the supreme order and the only oath to which he solemnly swore when he became a member of the military. He didn't swear an oath to the president, or a man. People are forgetting this. They don't understand why our Founding Fathers created this system of checks and balances. They were so wise that they knew this day could come. That's why the oath is written the way it is. Not enough people have studied this and know this, and it should never have had to happen. Lt. Col. Lakin shouldn't have been put in a position by our society and the U.S. government to have to stand up to the de facto putative president as being a usurper. Our system of checks and balances should have taken care of that, but it didn't. They all failed us. The Washington, DC establishment is a cesspool of corruption. It's a cesspool, and it's controlled by social forces, alternative-lifestyle forces that are pushing objectives to move our government totally away from right and wrong, the Army's core values, and the Constitution, the fundamental law of our land. They're trying to twist things and the meaning of words at every turn as in "What does the word 'is' mean?" and their contention that the Constitution is malleable without legal amendment thereof. For example saying that the 1st Amendment is supposed to be saying "freedom from religion" when it provides for freedom "of religion." They twist words. I believe that LTC Terrence Lakin was not given fair preliminary hearings, due process and other legal rights guaranteed by our Constitution by being denied the ability for even limited discovery and to call key expert witnesses to testify to the historical purpose and meaning of the commissioned officer's oath and true duty of an officer under his commissioned officer's solemn oath to support and defend the Constitution and to stand and defend it as his prime directive and not acquiesce to its usurpation or trampling. And Article II, Section 1, Clause 5, the presidential eligibility clause is as much a part of our constitution as is the 1st and 2nd amendments. I respectfully request that LTC Terrence Lakin be granted full clemency and/or the conviction by at his court martial be overturned and vacated and that LTC Lakin be returned to full service, pay and benefits, promotion, and potential eligibility for a future pension until such time as the constitutional eligibility of Obama is conclusively proven and confirmed by a controlling legal authority (if such can be done given what we already know about Obama's use of someone else's SSN on a back dated Selective Service registration) such as a Congressional investigation into Obama's early life missing original long form documents as to his nativity story and his fraudulent claim to natural born citizenship to constitutional standards. And image on the internet proves nothing in these days of PhotoShop. Obama is not only a usurper of the office of the presidency and command of the military he is also a criminal involving criminal document fraud involving both his bogus Social Security Number and a back dated and falsified Selective Service registration. Obama could have avoided endangering the troops under his command unnecessarily by providing a certified true and correct paper copy of his long form birth certificate, if one exists, like all the troops under him are required to provide prior to a foreign deployment. Internet images do not suffice. Obama chose not to stand up for the best interest of his soldiers under his command. Obama failed as a Commanding Officer and failed as a leader of men. He permitted the prosecution of a commissioned officer standing up for his oath to the Constitution and allowed a decorated officer and doctor to go to prison rather than he, Obama, providing a simple certified paper copy of a long form birth certificate issued by the state of Hawaii directly to a controlling legal authority to end that 2 year controversy. Campaign internet images of a short form do not suffice. Would a trooper be allowed to present a digital image on a laptop computer screen as adequate documentation as part of his pre-deployment processing? What's is required of the troops to prove eligibility and birth status beyond a reasonable doubt is also what should be required of their commander-in-chief. And a real commanding officer would have gladly provided it. Obama is unfit for command. 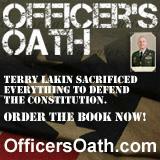 Please overturn the court martial conviction of LTC Terrence Lakin or grant him full clemency. The Constitution and being on the right side of history demands this. Allow LTC Lakin to return to full service to his country and the Army as a decorated and talented medical doctor while giving the legal and political system more time to expose the true traitor to our Constitution the military core values, the usurper Obama.